GET MOVING! 45 minutes of cardio to strength intervals perfect for the beginner, beer-gutted couch potatoes, post-partum moms, or anyone looking to find the body they left behind. Fun, fast-paced. Build tone, lose fat, get hooked. Intensive strength training with high volume agility and speed training. Blow-out master sets, with bursts of plyometrics to get your blood pumping and your mind challenged. 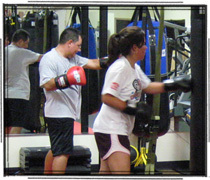 Perfect for the intermediate fitness enthusiasts or seasoned athlete.